This year has seen the expansion of our mental health science theme of work. We have engaged with scientists developing new treatments and testing them in research studies. Are these treatments that patients want? What are the ethical considerations of developing the treatment? 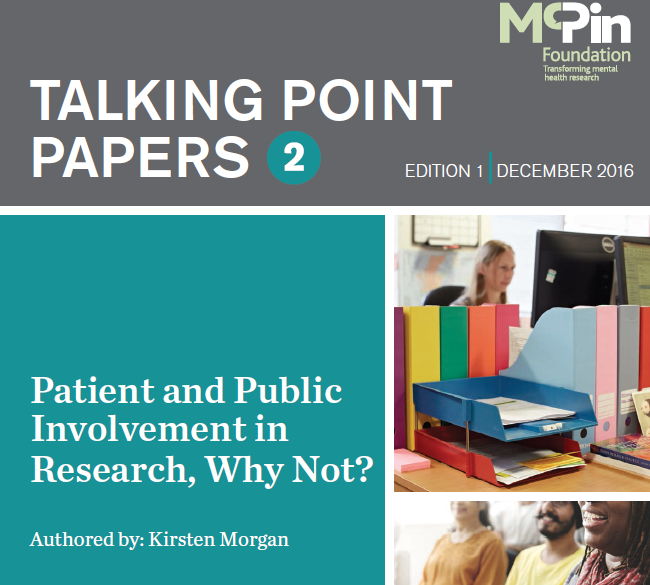 How can we improve the recruitment and engagement of research participants in the study? These questions are all something public advisors can help researchers think about and plan strategies to address issues that can arise. We are keen to more of this public advisory work – so do get in touch if we might be able to help you. Sometimes people challenge us about recruiting a group of patient advisors, feeling we will engage the usual suspects with advisors lacking diversity of experience and opinion, or worried the advisory group will end up being tokenistic – their advice not taken on board by a busy research team “set in their ways”. 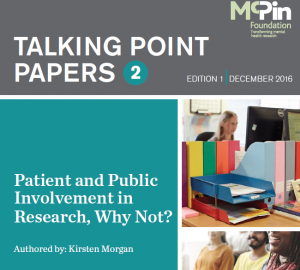 There is an ongoing debate about how much research knowledge advisors need, alongside their lay knowledge and experience of the topic being researched, to work with research teams effectively. Unsurprisingly, maybe, our response is that it depends. We are actively thinking about all these issues, and this is a key development this year at McPin with the publication of our ideas on this topic. We will do more development work next year on different approaches to PPI. This is a topic attracting attention. BBC Radio 4 aired a programme in August entitled ‘The Inflamed Mind’. The research is based at Oxford and Cambridge Universities and we are a partner in the study. Members of the PPI group have developed a website and written an information booklet to help people decide if they want to take part in the study as research participants. A PPI group member was on the BBC2 Victoria Derbyshire programme on December 8th to talk about her experiences. The programme is still available on the BBC iPlayer. The footage begins at 1hr 46 minutes into the start of the programme. A BBC news article was released on the same day. In this study we asked people with experience of psychosis to write vignettes for the researchers to use in the study. Lots of them. We were also asked to help recruit for the trial – the original planned recruitment strategy was struggling to generate the number of people needed to take part. So the McPin Foundation went out and about – giving talks and speaking with people in the community to gauge interest. We know that it is a good strategy to go out and meet people, rather than wait for them to respond to an advert or letter from the university to ‘get involved’ in our study. This is a really interesting study (called RADAR) and we have a brilliant PPI group providing advice to the research team. They have written scripts and recorded some videos to support researchers talking with clinical teams about the study. One issue that is emerging in a number of studies is how we communicate with people about the randomisation process. In a trial, which has two conditions within it being tested, people have a 50:50 chance of being in the control condition (sometimes that is treatment as usual) or the new treatment group. Explaining that people might not get the chance to discontinue medication in the RADAR study is very important as the team do not want to lose people after recruitment because they do not like the group to which they are allocated randomly. Other studies use a technique called participant preference allocation – hoping 50% will choose group A and 50% will choose group B. At the McPin Foundation we are interested in the wording being used to communicate with potential participants and have reviewed a few studies to look for examples. Next year we will be setting up another PPI group for research into recovery, led by Professor Mike Slade from Nottingham. More news on that study in 2017!